In Star Trek canon, IDIC is a Vulcan philosophy and also a prestigious Vulcan award of merit. The phrase in Vulcan is Kol-Ut-Shan. “The glory of creation is in its infinite diversity.” “And the ways our differences combine to create meaning and beauty. 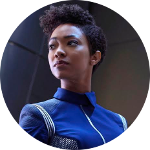 Over the years the term has been embraced by fans worldwide to mirror Star Trek’s collectively varied and diverse cultures all standing together as one and a symbol of the wide spectrum of human differences in all it’s forms. IDIC has become more than a piece of lore in a show bible, for many, it has become an ideal worth striving for. For SFC it’s a philosophy proudly rooted in the core of our foundation. ‘Star Trek’ has always been pictorial of diversity and inclusion and universality. It’s one of the main reasons it’s so important to so many people to this day. So if you say you love the legacy of ‘Star Trek’ but you don’t love that, you’ve missed the point. Starfleet may be a fictional organisation, but it is one that has always had ideals that the best of humanity has strived for. Star Trek originated with an ethnically diverse crew to show that one day we can set aside all our differences and fear to accept each other for who and what we are. That ideal became a vital part of the shows ideology; wearing the uniform meant more than serving as an explorer, it was a symbol of peace, unity and acceptance. A sign that one day we would all lay down our arms and truly become a unified global civilisation. The Admiralty Board and the members of Starfleet Command Quadrant 2 are proud to embrace that ideal, to neither judge nor discriminate by race, creed, disability, gender or orientation. To stand together as one in acceptance, unity and understanding. We proudly ‘wear the uniform’ to uphold more than just a fandom, but to uphold an ideal that we believe can and will benefit the world we live in. All members are treated equally and fairly and we believe in creating an inclusive culture for everyone within, and outwith, our fleet. As such, SFC Q2 has a strict no tolerance policy of any forms of discrimination. Those with an extremist view opposing or repressing those ideals we have all appreciated and aspired to through the decades have no place in the fleet.